The Combination Walk Around book is approximately 98 pages in length. 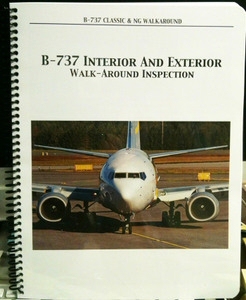 Describes in detail, pre-flight inspection of the Classic and NG B737. The Combination Walk Around book is approximately 98 pages in length.Begins with the cockpit setup, moving to the cabin, and then inspecting the airplane in a clockwise direction starting at the nose. Table of Contents in front and Index in the back.It has a set of photos where something is wrong and the reader must identity the abnormality.